The Alpha Jacket is a full cut, waist length model (27 ¼” center back length measured from the neckline to the bottom of the back hem, size Large) with zip-out quilted, insulated liner, zipper front and elasticized waistband. The jacket’s Nylon shell fabric has a waterproof/breathable barrier throughout the body, sleeves, and collar, and will be fully factory seam-sealed. The jacket is completely lined for a clean finish. Includes removable, quilted insulated liner with zip-off, detachable sleeves to convert into a liner vest for a cooler option. The liner provides complete body coverage, no gaps on the sides, with zippers on each side. 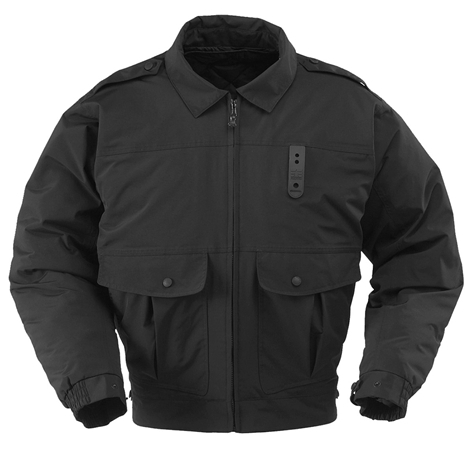 The liner in the Alpha duty jacket is constructed of 100% Polyester Ripstop, and uses a polyester insulation. The 3-in-1 laminate membrane design uses a highly advanced laminate system to achieve waterproof breathable performance. The three layers in the laminate membrane system consist of: 1) The outside Nylon shell (Polyester shell for the Hi Vis); 2) a Polyester Film laminate; 3) A Nylon Tricot Backer Knit. The Alpha Classic Duty Jacket, the Gamma Long Rain Jacket with Droptail and the Halo II Hi-Vis Reversible Duty Jacket have a 2-layer Performance Coating system to achieve waterproof breathable performance. The layers in this system include: 1) the outside Nylon shell; 2) A Polyurethane-based hydrophobic coating on the nylon; 3) A 100% Nylon interior lining on the Alpha Classic Duty Jacket and the Gamma Long Rain jacket—the Halo II Reversible does not have a lining since it’s Hi Vis side is the lining (Nylon outside, Polyester Hi-Vis side).